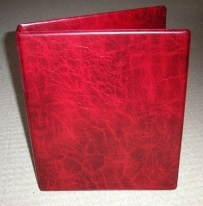 Our range of deluxe A4 standard portrait certificate binders have sturdy covers made from high quality padded PVC with a 4 ring binder that holds up to 50 acid free pockets. Ideal for certificate storage, photographs or keeping any other precious documents.There is a small clear pocket on the spine for indexing. Certificate pockets can be used with acid free card inserts to store two certificates, documents or photographs in each pocket. Also available are our acid free pockets with subdivisions for smaller documents and different sizes of photographs or memorabilia.